Lilian Childress received a $45,000 Cottrell College Science Award for her exploration of atomic phenomena called spin systems and their characteristics in diamond. An assistant professor of physics, Childress researches optical phenomena in atomic and solid state physics. Such phenomena are described by quantum mechanics, the natural laws that govern the behavior of particles on extremely small scales. Her particular focus is on an atomic defect in diamonds that could lead to a mechanism for quantum computing. According to those rules, a quantum bit — or “qubit” — can exist in an infinite number of different states that are simultaneously 0 and 1, dramatically increasing the computing power per bit. “For certain applications, a computer based on quantum mechanics could run exponentially faster than a computer based on classical mechanics,” she says. A quantum computer has yet to be built, and there is some debate over whether such a thing is even possible. Nevertheless, scientists around the world are exploring physical systems that could potentially provide the basic hardware. Childress is studying what she describes as “a relatively new addition to the ranks of qubit candidates” — the behavior of particles associated with a flaw in the atomic structure of certain diamonds. Called a nitrogen vacancy, this defect occurs where two of the carbon atoms normally constituting the diamond molecule are missing, and one of them has been replaced by a nitrogen atom. Pink diamonds have many nitrogen vacancy sites, which appear as tiny bright spots fluorescing in the diamond when it is illuminated by green light. By using light, magnetic fields and microwaves, the characteristics of the defect centers embedded in the diamond lattice can be measured. In particular, Childress is interested in what quantum physicists refer to as “spin” — subatomic behavior that adds a few mathematical complexities to the rotation we commonly associate with the word. 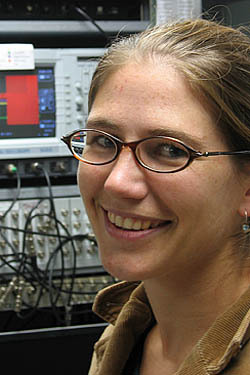 Harnessing the spins of particles within a nitrogen vacancy site, Childress says, could provide the basis for a rudimentary quantum computer. Childress, who joined the Bates faculty in 2007, received her bachelor’s, master’s and doctoral degrees at Harvard University. The second foundation established in the United States and, at the time of its founding, the first devoted to the advancement of science, the Research Corporation for Science Advancement was established in 1912. Cottrell College Science Awards support significant research that contributes to the advancement of science and to the professional and scholarly development of faculty at undergraduate institutions. Learn more.